There is no mystery as to why wood remains such a popular material for the home. Used both indoors and out, wood is extremely versatile and aesthetically pleasing. It works in any interior design scheme; modern or traditional, and complements many other materials. It is also extremely malleable and even when on site, final tweaks and additions to your design can be made. Factor in the range of looks available from a broad array of timbers and you’ve got an incredibly effective interior design material. Let’s look at some specific applications for wood in the home. Many looks can be achieved by varying the angle of the wood. Plain white horizontal timber will lead to a nautical feel, or “coastal chic”, look. Placing walnut panels on the horizontal plane will create a cool, contemporary look, and a similar effect can be created with stained white woods. Should you want a shabby chic or vintage look be sure to investigate reclaimed wood. There may be reclamation specialists near you to give advice and help you source your timber. By using reclaimed wood you’ll be able to create a really soft and mature style while saving up to 87% of the carbon cost of other timber products. More exotic looks can also be created, for example, a mashrabiya style latticework will be sure to visually amaze anyone who sees it. While you can create a smooth flow by continuing the use of wood from walls and onto the floor, a change of surface can often work well as a juxtaposed design concept. It is on the floor where the use of wood can be at its most striking and effective. Elegance will be very evident if dark wood is used for flooring. The dark tone will accentuate the grain which in turn increases detail and interest available to the space. Light will be absorbed by darker floor coverings so keep that in mind when you plan your lighting design. A gloss finish in the hallway will entice visitor inside while a matt finish in the bedroom adds drama. A paler wooden floor will add light to the room and can add a spa-like feel to bathrooms. The kitchen offers a unique opportunity to showcase this natural material at its best. 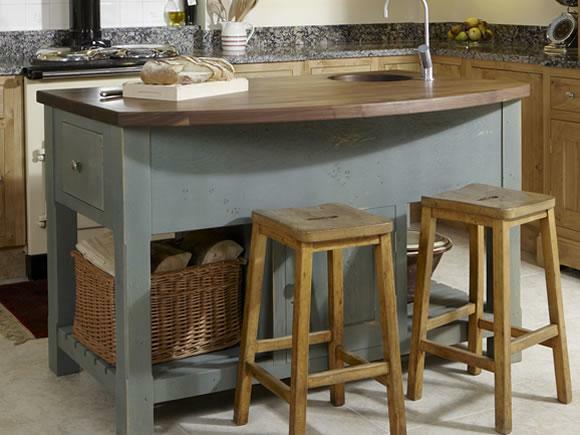 Tables, chairs, worktops and accessories can all be matched to stunning effect. Or pair a metal, industrial look worktop with wooden cabinets for a really contemporary kitchen.Black walnut worktops can be used to great effect if a darker look is desired. It will break up the while providing a timeless quality with a modern edge. The style you desire will dictate how and which wood you use; but the options are almost endless. There will almost certainly be lots of fabric and texture in this room so softer tones will work well. If you have a fireplace you can make this the centrepiece of the room. A wooden over mantle can give you a reference point when placing furniture and accessories. TV units, bookcases and coffee tables are also a great way to make use of wood in this space. About the Author: Jon Buck has been managing director at Bordercraft for more than 19 years. During this time he has overseen projects from a single drawer front for a local customer through to a complete Oak panelled office for a multi-national corporation in Japan. In his spare time Jon is a keen runner and loves travel and red wine in equal measures.